Poet’s Cottage has been attracting some lovely reviews this week. Thank you very much to Auckland Library for their review HERE. It was most interesting to see how the reader picked up the Enid Blyton influence in the book. I should say, however, that Pearl Tatlow in Poet’s Cottage is NOT Enid Blyton in any way shape or form. I was always fascinated by how Enid Blyton’s two daughters, Gillian and Imogen, had totally opposing views of their mother. I knew one day I would write about this theme and it simmered away for years. It interested me greatly because I knew of other families besides Enid’s – including my own – where children with identical upbringings have totally different accounts of events. It really made me contemplate truth, memory and history. How do we know what the bones are really singing? Whether Enid Blyton was a good mother or not never affected how I feel about Blyton. I know she made my childhood magical and I still love curling up with a Famous Five or one of her boarding school stories. But I was fascinated by the family set-up where you have to try to uncover whether the bones are lying or being truthful – or both at the same time. My writing friend, Jen Storer posted a lovely blog on Enid Blyton and Johnny Cash HERE. And my other writing friend Kate Forsyth was in the Spectrum this weekend with a beautiful photo of her reading to her daughter HERE. I was thrilled to see Kate also loves to collect the vintage editions of Enid Blyton rather than the sanitised versions. I agree that writers should be read as products of their time and not have their words reshaped to fit the mindset of later generations. The images of Enid Blyton in this post I found HERE. They are from an interview that Enid gave shortly before her death and I find them moving and poignant. They capture the fragility of the woman behind the words. I’m so grateful for all the lovely reviews of Poet’s Cottage and that so many people have taken the time to discuss their thoughts on the characters and the set-up. It has been fascinating to see how the book has really delighted people from a range of backgrounds and ages. Fellow Sydney writer Elisabeth Storrs posted a lovely and thoughtful piece on Poet’s Cottage HERE. I love the final paragraph because Pearl’s gramophone also haunted me for quite a long time. Poet’s Cottage is an accomplished, engrossing novel with fine language and powerful descriptions of the small town inhabitants of Pencubbit in both past and modern times. Most of all, in creating the damaged and damaging Pearl, the author has created a character so compelling and complex that the image of her lingers just as surely as the strains of music from her gramophone drifted through Poet’s Cottage both before and after her death. I shall post links to some other reviews as soon as I get a chance. Life has been hectic here in the Little Brick with my daughter home on holidays. She is writing more than I am able to at the moment. I do love seeing her happy and creative and able to stay in her pyjamas all day if she wishes. We went to see the movie Brave, which was a wonderful film showing the power plays between mother and daughters. I shamed myself by weeping over the final scenes and my daughter had nightmares that night over the bear – but still, a glorious couple of hours in the cinema. 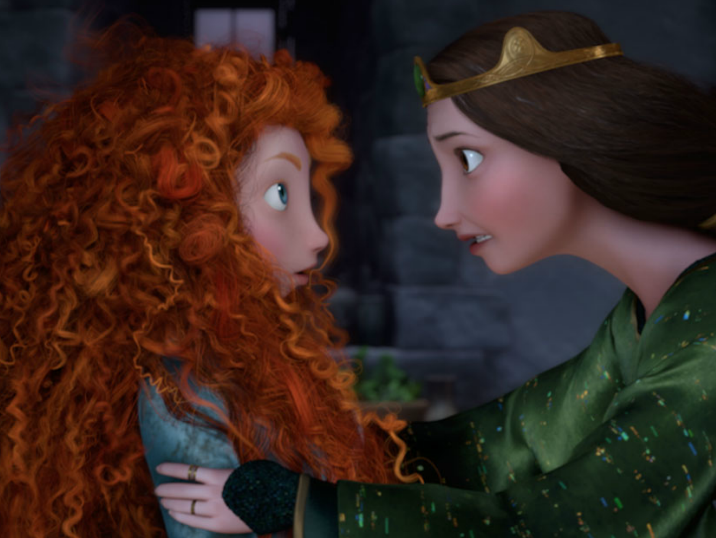 The writer based the character Merida on her own feisty-daughter and it’s easy to see why so many mother/daughters are enjoying this holiday movie. An added bonus for me was the whimsical and beautiful trailer before Brave, La Luna. I really enjoyed this charming short film. David and I saw The Mousetrap, which is now touring as part of its 60th Diamond Anniversary year. I had been looking forward to seeing for ages. It’s my third viewing of this iconic play (I originally saw it in The West End). Although nothing can compare to the romance of seeing Agatha Christie’s play in London, the Sydney cast did a really terrific job. I was pleased they kept it in a very traditional style and didn’t camp it up too much. Although a couple of times the accents were a bit forced, I still felt as if I was really at Monkswell Manor. cast rehearsal image via Mousetrap Sydney website. From the eerie opening of the play where the child’s rhyme, ‘Three Blind Mice’ is sung to the shock denouement at the end where a lot of the audience gasped at the twist – to the actor requesting we keep the secret (and of course we all will) – I thought the spirit of Agatha Christie’s play (which she did not expect to run for a few months) was honoured. It’s proof of how people love a good cosy mystery and Agatha is top of her game in this sly and haunting play. You can read about the horrible true story HERE that inspired Agatha Christie to write her dark and elegant play. Terence O’Neill and his brother, Dennis in 1945 were fostered out to a pair on a farm in Shropshire, England. The brothers were beaten and abused by the foster parents and sadly, Dennis died. Agatha followed the case which made headlines in the UK and helped to change laws to protect children and used the case for a short radio play, Three Blind Mice (which later became The Mousetrap). Terence O’Neill has since written his own book of the events, Someone To Love Us. the devious mind behind The Mousetrap. Hats off to Agatha. ‘Love’ for Enid Blyton inspires – People – News – Inner West Courier. Sambhu Canine with his copy is via one of my Facebook friends, Lynn Priestley. I’ve had quite a few queries from people on where to buy – hopefully this post will cover the selling side. I’m having flashbacks now to my years as a sales assistant on cosmetic floors where I had to stop people cold and try to convince them that ‘Yes, sir, your wife would love this fragrance’ moisturiser, toner, etc). Not the best job for a natural introvert but it provided me with ample people study. Hopefully if you’re reading this you’re already interested in my book and so I’m not doing the hard sell. And so if you have been even half-way thinking of picking up a copy – it would be appreciated if you get it now and not wait a few years in the hope it will be marked down. All good bookshops should have copies in stock. I know my local Better Read Than Dead (inner Sydney) should still have signed copies, but after my friends have rushed them they could be running low. Better Read Than Dead do online ordering and if you would like a signed copy, if you request one when you order I’m happy to head into their store and sign it for you. Their link is HERE. Just state at the time who you would like it made out to. Other outlets like Big W and Target should also have copies in stock. If you are broke (don’t worry I’ve been there many times so I understand) but you would still love to support me – please head to your library and request they order you a copy. Library sales are also very welcome to writers in Australia as once a year we receive a cheque for every book loaned out. It’s not huge money for me ( it would be for some authors) but it’s good lipstick money. And most importantly – please spread the vibes and good word. It is word of mouth that really helps to move books. If you know anyone who enjoys Midsummer Murders, mystery novels, Agatha Christies, the 1930s, Australian Fiction, Daphne du Maurier, Enid Blyton – then please tell them about Poet’s Cottage. If you are in a book-club then suggest it as a possible read if you think it suits their reading agenda. The more the jungle drums beat out there – the more the energy is passed along. mothers doing the school run who have ran up to me clutching copies for me to sign; countless emails from friends on the internet who have rushed the stores and shown such genuine enthusiasm for the story. I’m gobsmacked by your vibes and love this week. Thank you also to LOVETHATBOOK on the Gold Coast for making Poet’s Cottage their book of the month. And to the Tasmanian Mercury for doing their lovely spread and for giving me the cover page of the books section. Karen Brooks who wrote the most beautiful review I could have imagined on her Good Reads. I shall post this with her permission in my reviews section as it was so insightful and thrilled me so much. This week I start my radio interviews. I’ve never spoken on the radio in my life so looking forward to a new adventure. My beautiful Magic Hat Bookglams organised a little party for me at Better Read than Dead. The Great Gatsby was slightly ignored that night as we celebrated Poet ’s Cottage and my friend, Manisha Jolie Amin’s book, Dancing to the Flute which also hit the bookshelves this week. More on that later. And there may possibly – thanks to my Hatters – be an event/launch book for Poet’s Cottage so watch this space if you are in Sydney and would like to attend. Being the no-fuss, no-frills person I am I wasn’t planning on having a launch but the Hatters are insistent. There’s no arguing with my Bookglams. If I could thank you all with as much beauty and style as Elizabeth Taylor does in this clip following then I would. Thank you for making a week so sparkly, joy-filled and celebratory. And thank you also, if you managed to make it through this post. One last thing – Mother’s Day is approaching and Poet’s Cottage would make a beautiful gift for the important woman in your life. Receiving a book wrapped in brown paper and tied with string is a magical thing. Here’s one of the important early complimentary copies I sent out to an important woman to Poet’s Cottage. Aussie Book Review: Poet’s Cottage by Josephine Pennicott. How exciting to read that a manuscript of Enid Blyton’s has popped up in a children’s book centre. Although Mr Tumpy’s Caravan doesn’t sound my ideal Blyton (I prefer Famous Five or the boarding school stories), there’s something so Blytonish about this lost manuscript suddenly appearing. And so I’m celebrating this historical moment along with other Blyton fans around the world with a toast of ginger-beer and keeping my fingers crossed the powers-that-be don’t decide to ‘modernise’ Mr Tumpy’s Caravan before publication. In our house we read a lot of Blyton. My daughter adores the Faraway Tree and Wishing Chair books and never tires of them. She also loves Blyton’s books which are about children – rather than the modern trend of using animals in place of children. And I’ve been slowly collecting all my old Blytons that my mother sent to op-shops when my back was turned. Tony Summerfield of the Enid Blyton Society was quoted in the London Telegraph as certain there are no other Enid Blyton manuscripts sitting around. It’s still lovely to imagine that somewhere out there are early drafts of Famous Five or a mystery never seen. And so, if you are interested in a fantasy of a caravan with a mind of its own, a dog-headed dragon and a princess, then cheer along with me that Mr Tumpy’s Caravan has been discovered.